festival urbinoinacquerello 2017 - Benvenuti su urbinoinacquerello! 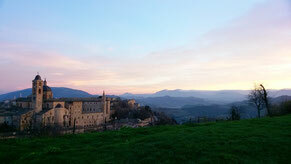 The Festival takes place in the city of Urbino, in the province of Pesaro and Urbino, in the Marche region of Italy. Take the 'Bologna-Taranto motorway, exit at Pesaro-Urbino exit, then proceed towards the SS423 Urbinate for a distance of 28 km. From the highway exit it takes about 40 minutes to reach the city of Urbino. Take the A14 Bologna-Taranto, exit at Fano exit and proceed on the SS3 Flaminia towards Rome. Once past the Fossombrone West exit, continue on the left on the SS423 to Urbino. Take the SS3 Flaminia towards Fano. At the exit to Furlo and Calmazzo continue taking the SS423. Take the E45; exceeded the S.Giustino exit, continue taking the SS 73bis towards Urbino and Urbania. The nearest railway station to Urbino is located in Pesaro. Here's site of Trenitalia and Italo to consult the schedules and book tickets. From here you can take advantage of the frequent buses that are with Urbino destination. In Pesaro the bus stop is located in the square opposite the railway station.